Travel Family 'Round The World The City of Life! While we weren’t sure how the trip from Phuket would go, our VIP bus proved to be quite comfortable and we arrived at Bangkok’s Southern bus terminal as scheduled around 7:30am. Once we got our things together it was time to pop out the guide book and call around to find a place to stay. After mulling it over in our minds, we decided to stay at a hotel in the Siam area of Bangkok. Siam is probably the most central area for a visitor in Bangkok as it is located where the two sky train lines come together. It is also home to several large shopping malls and hundreds of wonderful places to eat. How could we go wrong? After we called and booked a room at the A-One Inn, it was time to catch a taxi. Luckily the hotel is in a well known area and we were able to convey to the driver details about where we needed to go. The drive into the city took around thirty minutes and really wasn’t too bad. The morning traffic seemed light, although this is a holiday week, so many people may be taking some time off. The taxi dropped us off on the main street and we had to walk through an alleyway to get to our hotel. The alley that the A-One Inn is located on is full of atmosphere and charm with food vendors dishing out noodles and other food seemingly 24 hours a day. After our short walk, we arrived at the hotel around 8:45am and were delighted to find out that they had a room ready for us. After napping for much of the morning, we explored a lot of the area around the hotel, but didn’t head out too far. This area of Bangkok is like a concrete jungle with the two sky trains crossing over it. The sidewalks are busy and the city seems a bit dirty, but I have to admit it has a charm to it. With Thursday being a day of so little activity, we were ready to see some of Bangkok’s sights come Friday morning. 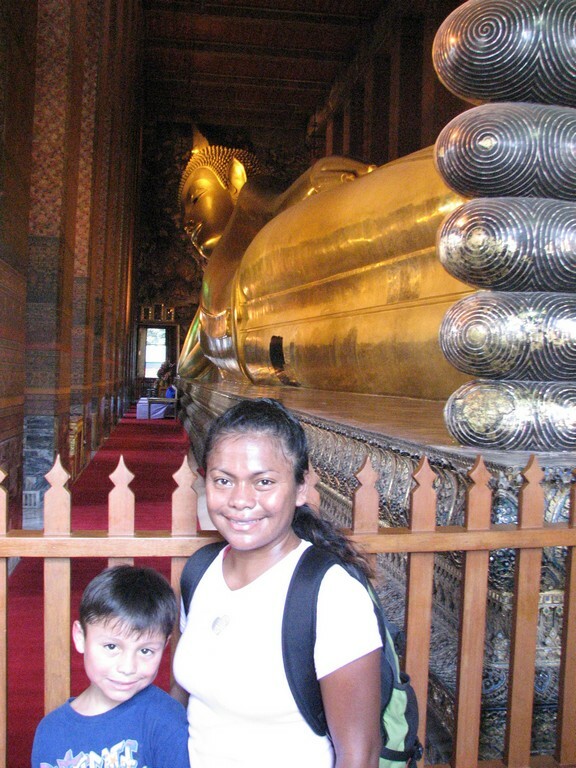 To get our feet wet, we started with a trip out to Wat Po and the Royal Palace. Getting to the Royal Palace from our hotel once again involved taking a taxi. We quickly found out that the taxis sitting near the hotels only want to charge inflated fares instead of using their meter. It took us awhile to find an honest driver, but after a few minutes we were on our way. Once at the Grand Palace we were disappointed to find it closed for the holiday week. Fortunately Wat Po was still open and they weren’t charging any admission fee because of the inconvenience, so we really couldn’t complain. After all, Wat Po is a very large compound of buildings and we still had plenty to look at! The two main draws of Wat Po are the Temple of the Emerlad Bhudda and the Temple of the Reclining Bhudda. While the Emerald Bhudda is very small and sits on top of a very large stupa, the Reclining Bhudda is long and takes up a whole building by itself. I remember the first season of the Amazing Race where this area was highlighted. In that episode teams had to go around to all of the jars around the Reclining Bhudda and drop coins in. (This is an activity believed to bring good luck!) The team that had the exact right amount of coins won. We couldn’t help but do it ourselves. Walking around Wat Po and the surrounding area really gives you a great dose of the wonderful architecture. This area certainly isn’t like anything at home and the atmosphere is incredible. After awhile I started to look for monks and when one emerged, I would try as stealthily as possible to take a picture. They started to catch on eventually. After nearly two hours of walking around, marveling at the buildings, taking a lot of photos and relaxing in and around the temples, we exited and then strolled five minutes to the river for a ride on Bangkok’s infamous river taxi. At first when we reached the pier it wasn’t clear what to do, but after five minutes of hand motions with the employees who didn’t speak any English, we had a ticket and were on the water. We only stayed on the boat for four stops until we reached Khao San Road, but the ride offered some wonderful views. Khao San Road is world famous for being a backpacker’s mecca. While we are traveling around the world and do carry backpacks, this type of place is not one that children normally are found at. However, it is a cultural icon (what culture?) and a day time visit seemed warranted. The street itself is full of Bohemian characters lounging around at one of the many cafes. I don’t think we saw any Thai people other than employees at the businesses. After a few minutes of Bohemian culture, we tried to get a cab back to the room, but this proved difficult. One after another, the taxis refused to bring us unless we paid an outrageous amount. Eventually we decided on taking a tuk tuk, even though we still had to pay about double what a taxi meter would have cost. The traffic was bad and this was their excuse for not wanting to use the meter. Our first two days in Bangkok went rather well. Yes the city is smoggy and loud, but I have to admit it does have a real charm. I am definitely warming up to the Thai people as well. They are very friendly and just love Shawn Reece. While he is still shy from all of the attention, he lets them pet him and poke him anyways. You would think he would have gotten used to it by now. Oh well! More from Bangkok tomorrow. Next articleA Descent Into Chaos!